I decided to go ahead and stay with the programming interruption for yesterday. Normally the fruits of my photography shoot labors go on my FIFO darkroom queue. Unfortunately, that means you might not see anything for a long long time – (as regular readers may know, the Yellowstone trip from May 2013 is just know being worked up. Since yesterday’s post was such a downer, thought I’d brighten it up a bit and talk about a silver lining that came out of the tragic event. Once everything was wrapped up with the wreck, we continued on to Emiquon National Wildlife Refuge – or intended destination before we were sidetracked for an hour or so. The wildlife was primarily made up of water chickens but my golden rule is to look for the outliers. This was what I was doing while standing on the cement blocks along the shore. Disappointed that a potential find ended up being just another chicken I lowered The Beast. At that time movement was detected. Absolutely stunned, this appeared. Up came The Beast and the snapping commenced. To be honest, I was not exactly sure what it was. It definitely did not fit the Sandpiper family – the bill was way too thick and those feet where mega-thick. As my brother can attest, I’m not one for really doing my identification in the field. If it is bright out, it virtually impossible to see the 7000’s LCD screen anyway. Check the image histogram (which is easy to read) to make sure the full range of exposure is available and focus on getting as many angles as possible to aid in the ID process. Hit the jump to read a bit more about this unique bird. For about a minute, this cool bird wandered around on the shore rocks completely oblivious to the fact someone was standing 15 feet away with a large black object pointed directly at it. Wish I had panned down just a bit on the next shot so the feet would not have been chopped but suspect I wasn’t able to get the focus point moved up and this is all the room I had to frame with someone more on their game would have turned the barrel and moved the zoom out a bit to properly compose it. The fact that this was a +1 for my NA Birdlist got the adrenaline pumping a bit too high. Once the shoreline had been sufficiently inspected it started hopping into the reeds. That is bad conditions for The Beast. A slight move off of target and the focus would drift to the closest reed – rear button focus is the savior in these conditions as long as the main subject remains fairly still. This bird was jumping and darting all over the place. By now I was able to get my UBs attention and get her to come up beside me. We’ll need to have a talk about Facebook reading vs UB responsibilities! The two reasons I wanted her there were to a) witness this cool bird both for her own experience and to provide validation should my SD cards fly out of my camera into the water. The second reason being b) to help keep track of the damn thing. Your field of vision is restricted looking through the glass – if you lose the subject it is difficult to find it again when you put the glass down. Just realized I forgot to ID this bird for you. 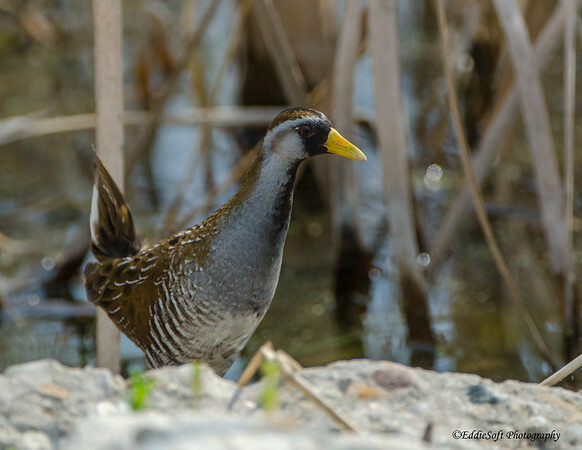 Best guess based on the research is this fine specimen is a Sora! The first time I’d seen this name was last week on the Chain O’ Lakes Bird List. No idea what it was then and no idea that I was looking at it until I was back in the car driving back to Banner Marsh. A quick thumb through the Stokes reference provided the initial ID… and prompted the immediate text to my brother Ron that the list just got a +1. Eeesh, almost out of pictures – get to the facts man, get to the facts. 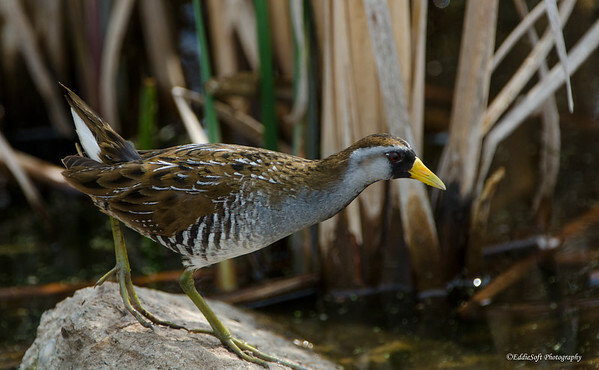 The Sora is actually from the Rail family and according to the fine Cornell website, is the most common of that family in North America, yet very secretive. 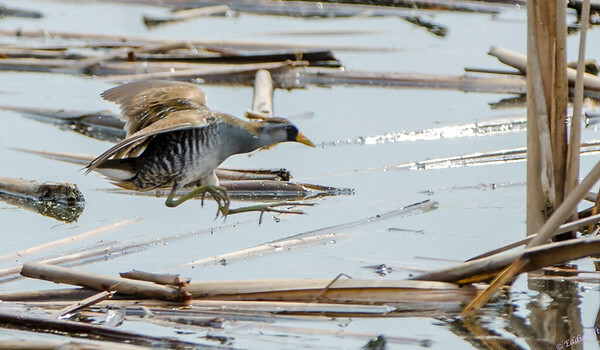 Obviously, since Lind have spent a lot of time in marshes over the years and NEVER seen this bird. Cornell let me down after that introductory tidbit. Not interesting facts and a total of three lines in the Life History section. It definitely has a unique voice and one I’ll be on the lookout for now on. Their region covers all of the North American Continent and a bit into South America. They are supposed to be here in the Summer so this one is a bit early. Wikipedia had a few other comments indicating they can move around by walking or swimming, omnivores and are possibly located through the use of a call broadcast. They’ll respond in kind or investigate the source. 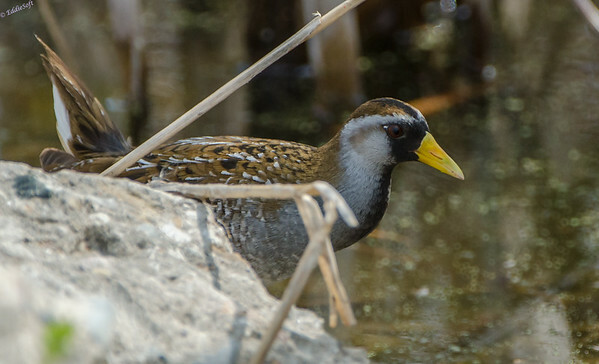 They did mention that water and emergent vegetation are important Sora habitats – Emiquon fits that description perfectly. Sorry for the soft shot below, but I left it in so you can see how it jumps from reed to reed – also gives a good view of those impressive feet. Pretty happy with this find. A positive on a day that had its fill of negatives. Hope you enjoyed the shots of this unique bird – all that is left to do is put that check in the Birding Life List. Awesome! That bird looks a lot cooler than on the Cornell site. 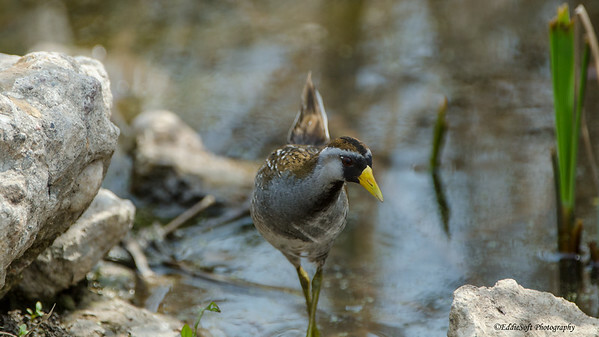 They say a birder probably will never seen one unless they wade around in marshes, so you were fortunate. I know I’ve never seen one of these creatures in my life, and I had never heard of one until your text arrived. All the pictures are great, but that first picture is fantastic! Thanks! 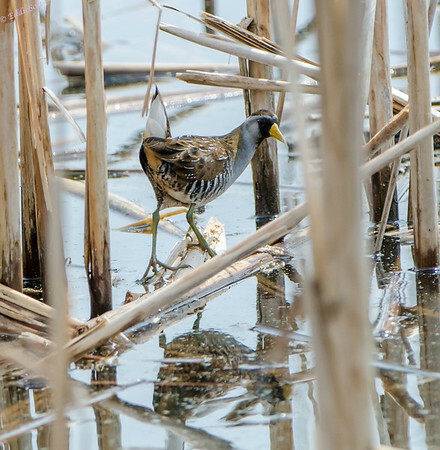 Like I mentioned, I was totally surprised when it popped out of the reeds in the marsh – had about 10 seconds to get the shots before it headed back into the marsh – you can see the results once it got mingled in with the stalks. The last shot is admittedly soft but I do really like the first few – always a slight bit of nervousness while on Manual mode – Getting more confidence but there are a lot of variables to address when shooting moving objects in the field.